People want a place to gather and to support each other. They want to listen and be heard. Let them meet each other using the latest in social community features, customized for your unique needs. Using BlippMedia, you're ready to get people talking. The most rewarding aspect of a healthcare community is being able to truly support and contribute knowledge to patients and caregivers. The success and popularity of patient communities continues to grow and support thousands of users. To find out more about how we handle social communities for health care, give us a call. Truly own your community data, your investments and have a flexible bussines model. 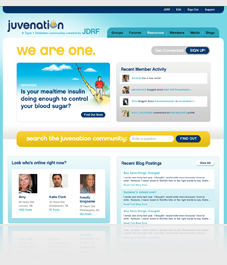 Juvenation.org is a very active social network for the Juvenile Diabetes Research Foundation (JDRF) especially for people with type 1 diabetes.